Pacific Rim is a 2013 American science fiction film directed by Guillermo del Toro, written by del Toro and Travis Beacham, and starring Charlie Hunnam, Idris Elba, Rinko Kikuchi, Charlie Day, Robert Kazinsky, Max Martini, and Ron Perlman. The film is set in the 2020s, when Earth is under attack by Kaijus, colossal monsters which have emerged from a portal on the floor of the Pacific Ocean. To combat the monsters, humanity unites to create the Jaegers: gigantic humanoid mecha, each controlled by two pilots whose minds are joined by a neural bridge. Focusing on the war’s later days, the story follows Raleigh Becket, a washed-up Jaeger pilot called out of retirement and teamed with rookie pilot Mako Mori in a last-ditch effort to defeat the Kaijus. 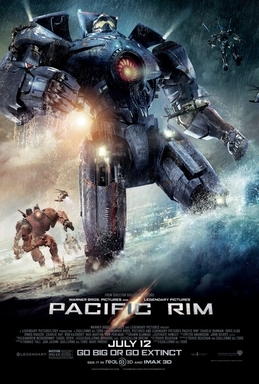 Del Toro envisioned Pacific Rim as an earnest, colorful adventure story, with an “incredibly airy and light feel”, in contrast to the “super-brooding, super-dark, cynical summer movie”. The director focused on “big, beautiful, sophisticated visuals” and action that would satisfy an adult audience, but has stated his “real hope” is to introduce the kaiju and mecha genres to a generation of children. While the film draws heavily on these genres, it avoids direct references to previous works. Del Toro intended to create something original but “madly in love” with its influences, instilled with “epic beauty” and “operatic grandeur”. The final credit dedicates the film to Ray Harryhausen and Ishirō Honda. The film is produced by Legendary Pictures and distributed by Warner Bros. It was released to generally positive reviews on July 12, 2013 including releases in 3-D and IMAX 3D. This entry was posted on Saturday, July 20th, 2013 at 4:16 pm	and posted in Uncategorized. You can follow any responses to this entry through the RSS 2.0 feed.